Virtually every dog I’ve ever met has suffered from autism. Don’t believe me? Consider that, a) Virtually every dog I’ve ever met has been vaccinated against canine diseases, and b) Not a single one of them ever spoke so much as a word afterwards. Connect the dots, folks, connect the dots. You might argue that the odds were fairly good that the dogs weren’t saying much before their shots either, and that autism doesn’t even exist in dogs. But you don’t live in Brooklyn—or if you do, you may not live in the neighborhoods where they’ve drunk the hand crafted, gluten-free Kool-Aid. Those are also the neighborhoods where they look askance if you listen to music on anything other than vinyl—provided the vinyl is of the locally sourced, farm-to-turntable variety; where infant hipsters are issued their first pork pie hat—two sizes too small, please—almost at the moment of birth. It bears repeating—though it really shouldn’t need repeating—that the autism-vaccine link has been disproven again and again and again and again. The lie was born of a fraudulent 1998 study conducted by British Dr. Andrew Wakefield, purporting to show a link between autism and the measles-mumps-rubella vaccine. The paper was later retracted by the journal that published it and Wakefield was stripped of his right to practice medicine in the United Kingdom. But sensational lies are like stubborn viruses, and in the warm, humid corners of the Internet they thrive and spread. There is a reductum ad absurdum quality to the fact that the autism lie has now persuaded a privileged pocket of pet owners to try to protect their dogs from a condition they can’t get—courtesy of a shot that couldn’t give it to them in the first place—by refusing to protect them against diseases they can get. 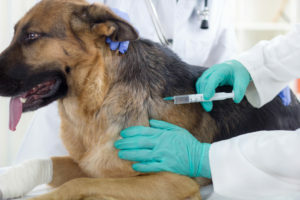 As with parents who refuse to vaccinate their children against disease, pet owners who refuse to vaccinate their dogs are potentially causing widespread harm. The unvaccinated child is not only vulnerable to preventable diseases including measles, mumps, whooping cough and polio, but also presents a danger to the people around them serving as a potential carrier for those and other diseases. It takes vaccination rates as high as 95% to create what’s known as herd immunity, the protection afforded to people who can’t be vaccinated—including infants, the very old and people with compromised immune systems—by all of the other people in the community who can be, thus denying the disease any infectious toehold. The same is true of canine vaccines. And if you’re inclined to think, well, that’s a problem for the dogs to sort out, think again. Rabid dogs, for starters, are a threat to everyone. More worrisome, leptospirosis, a vaccine-preventable bacterial infection carried by rats, spreads readily to dogs and then to humans. A serious outbreak struck the New York-New Jersey area in 2017, and Brooklyn itself was hit in 2009. The disease is often fatal in dogs. In humans it can lead to liver failure, respiratory problems, meningitis and, in extreme cases, death. The terms of the canine-human contract were clear from the moment the two species tumbled for each other more than 15,000 years ago. They would offer us companionship, protection, a willingness to work and a fierce loyalty, and we would offer them food, shelter and protection. Canine anti-vaxxers are in increasing violation of the last of those terms. Dogs, it’s worth remembering, have the smaller brains; humans have the much bigger ones. It’s always a good idea to use them. This entry was posted in ADD/, Children, Mental Health. Bookmark the permalink. ← ADD/HD and a DOG- A COMBINATION MADE IN HEAVEN?